I'm baking for some time now with satisfying results. Two weeks ago, my spiral mixer broke down and I received a new one. Same size (20kg), but a new type. This one is slightly faster than the previous monster. For my normal batch (100% white flour T65, 75% hydration) I used to mix 2 times 20 minutes. The dough came out well developed and I did one turn during bulk. Now, with this mixer, the dough has the same development after 4 (!!) minutes. I was happy with this, saving me lots of time. Now, handeling in the same way as before, the loves rip while baking. I thought this was due to the short mixing time so I doubled. And doubled. And doubled. With the same ripping result until the dough became over mixed and fel apart. So. What is going on? are the loaves underproofed? Loaves will rip open like that if underproofed. Maybe the new machine is affecting the gluten development and that is affecting the proofing. So was my first thought. 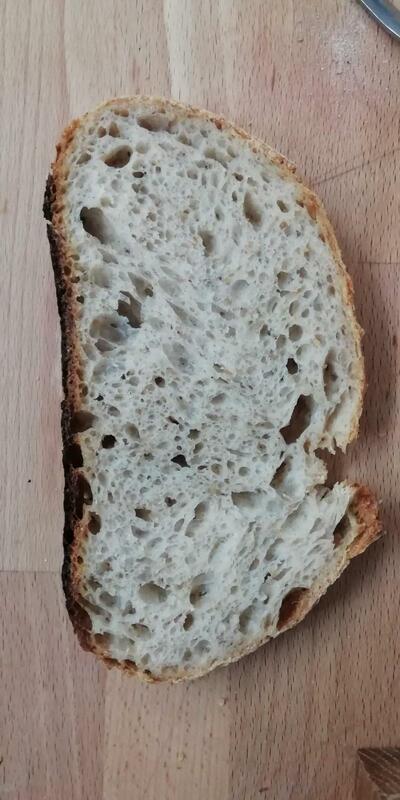 But as jou can see, the crumb is fine. Longer proofing makes the loaf collapse. is my guess. Mix up the dough to shaggy and then let it autolyse 8 to 20 min. Let the flour have a chance to absorb the water, hydrate and swell before finishing the mixing. Just try it. This is the case... I always do an autolyse of 20 minutes. Yes, the crumb looks great. 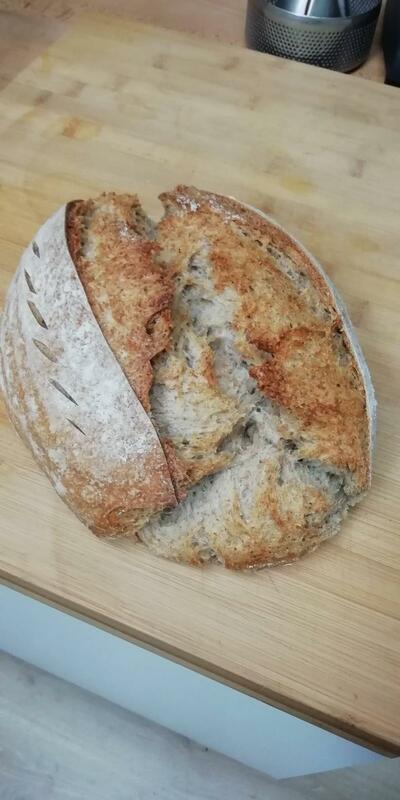 Generally under-bulk fermentation is the cause of these, but it could also be that the gluten wasn't developed properly by the time you shaped, and/or that the shaping didn't have adequate tension. I was reading Trevor Wilson's Open Crumb Mastery yesterday and he talks about all these factors. Incidentally, many favor a much shorter mixing period than you were previously doing (to avoid unwelcome oxidation resulting in loss of flavor and over-working the gluten), followed by folds. If your dough needed periodic folds to build the right gluten tension while bulk fermenting, and you didn't do those folds, it could be a structural problem. -Did you preshape and bench rest? If so, how much tension did you build? -Describe your final shaping and how much tension was built. But is it gummy? Does the knife come out clean when cutting the loaf? "The type of mixer. Spiral mixers, oblique (axis) mixers, and planetary mixers are the most common types used by professional bakers in the United States, and stand mixers (similar inaction to planetary mixers) predominate among home bakers. Not only are the revolutions per minute different in each speed for each mixer, the mixing arms affect the dough differently. Spiral mixers are highly efficient, and develop the dough comparatively quickly without an excess of oxidation. Being so efficient, they also have the ability to overmix a dough quite quickly, and so require careful timing." Could it be that the motor on your new mixer has a higher power output (i.e. puts more work into mixing) than the old one, and therefore over-mixing the dough? What speed is your mixer running at? Classically, I think spiral mixers run at 100rpm 1st speed and 200rpm 2nd speed, but each maker has their variations. Also it's more complicated now as a lot of mixers are variable speed and it's more difficult to compare mix times. As a guide, in my small IM5, I usually find 2 minutes on 2nd speed is sufficient. Having said that, your crumb loooks nice and open - I think if you were excessively mixing, then you would have a tight crumb. Your mix times with your old mixer seem very long - maybe that was a single speed mixer with only one speed? Perhaps the bulk ferment is the area to look at; duration, temperature, levain (or yeast?) qtty. HERE is an example of a nice looking dough at the end of bulk (about 3 - 3.5hrs @ 28c, I would guess) - very proofey, to use the latest technical jargon!